Under the Visionary Guidance of Mr Pankaj Agarwal, Vice Chairman, GLBIMR and Dynamic Leadership of Dr. Urvashi Makkar, Director General, GLBIMR celebrated its 10th Foundation Day on September 5,2016 with great Exuberance, Vivacity and Radiance. 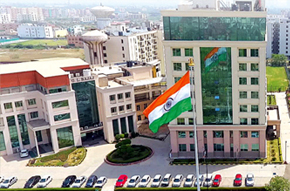 GLBIMR was established in the year 2007 on the same day and since then it has embarked on its vision of imparting Quality Education to thousands of students and budding professionals. Our Grandiose Chairman Shri Ram Kishore Agarwal Ji established the Institute on September 5, 2007, on the occasion of Teachers’ Day. Dr. Urvashi Makkar while exhorting the faculty members, staff and students explained the importance of Foundation Day and also the phenomenal role of Our Vice Chairman, Mr Panjak Agarwal in the success of GLBIMR. The day was marked by an auspicious Hawan Ceremony that was conducted in the campus in the august presence of Mr Pankaj Agarwal, Vice Chairman, GLBIMR. Hyms and Mantras allured in the positive energy as all faculty members, staff and students joined hands in prayers to seek God’s blessing. Students, Staff and Management of GLBIMR were full of pride and joy as GLBIMR celebrated its 10 years of establishment.